Florida State comes to the Carrier Dome to take on Syracuse on Tuesday night at 8 p.m. ET. Every Monday throughout conference play, the ACC hosts a coaches teleconference where the league’s head coaches field questions from the media. Yesterday, both the Syracuse Orange’s Jim Boeheim and Florida State Seminoles’ Leonard Hamilton spoke in brief about the current state of their respective teams. We’ve highlighted notes from those conversations yesterday, below. Hamilton made mention of his team’s so-so start to conference play (just 4-4), how FSU will have to adjust to the Carrier Dome and says his team is struggling offensively. The Seminoles have been plagued partly by the flu and partly by paltry perimeter shooting. Boeheim’s conversation shifted mostly around his guards and how the stars are starting to align for Syracuse. There’s been a lot of discussion about Howard being back to his old self. It’s been well-documented to this point, but Howard missed the first four games with a preseason ankle injury that required surgery. He’s played some of his best basketball in the ACC though with a big game against Duke and a couple solid outings these last two weeks. Howard has hit at least three 3s in his last four games, and has a combined 10 steals in those four. “Frank is back at full strength now. It took him a while to get back I think. But he’s playing at a much higher level than he has at any time this year. I just think everything is coming together. 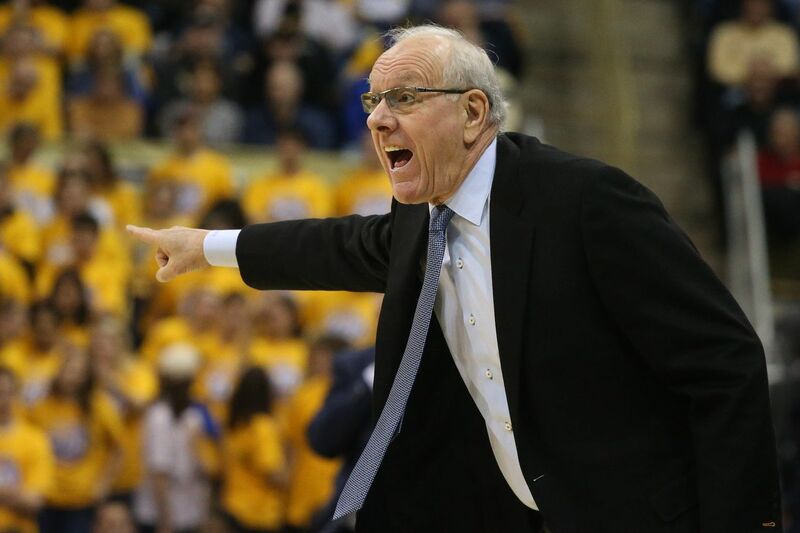 We’re playing much better than we did early in the year,” Boeheim said. I asked Boeheim how he goes about deciding the third guard in rotation, as that has varied at times this season. He said it’s a decision that’s made on game day, and what he thinks is best at that time. Boeheim did say that Jalen Carey is still working hard in practice. Against Virginia Tech, Carey saw action early as the first guard off the bench when the Hokies applied a high-pressure man-to-man defense. Buddy Boeheim saw action as the first guard off the bench against Boston College and Pittsburgh while Carey did not play in either game. Buddy’s first three of the game last Saturday came when Pittsburgh was in a 2-3 zone. Asked whether or not the type of defense opponents are playing factor into whether Carey or Boeheim come off the bench first, Jim Boeheim said it didn’t. Florida State ranks 226 in the country in three-point percentage. The Seminoles have made just 150 3’s this season, which is just over seven per game. Hamilton said his guys shoot it well in practice, but it comes down to individual development and that it might be a confidence issue. He also said that during FSU’s three-game losing streak, three of his starters didn’t practice until the day of the game. Some guys were plagued with the flu and sophomore MJ Walker missed action when he bumped his knee earlier in the year. Florida State didn’t get much time to practice in between Saturday’s win against Georgia Tech and tonight’s game against Syracuse. The short time to prepare won’t be much of an advantage as, say, when Virginia Tech had five days to prepare against Syracuse when the Orange had just one day. Syracuse also played on Saturday against Pittsburgh. Both teams will be under the same circumstances as it relates to the quick turnaround. Hamilton closed by suggesting that the current ACC is the greatest college basketball league of all-time, especially when considering each team is a different challenge. He said this will be FSU’s third game against a zone as Miami threw in its 1-2-2, Georgia Tech played its matchup zone on Saturday and now Florida State will take on Syracuse and its 2-3 zone. For Syracuse basketball stories and updates, follow Nunes and James on twitter @NunesMagician and @JamesSzuba.